Have you bought all your Christmas presents? Are they wrapped up and under the Christmas tree? The Scottish title is really only a novelty gift package, and comes complete with instructions about how to change your name by deed poll so you can use the novelty title. It is all harmless, good fun, and probably helps to conserve a large forest and tract of Highland in Scotland. On the other hand, it is amazing how many people fall for the sale of bogus and questionable feudal titles in both England and Ireland. While the remnants of feudal tenure were abolished by statute in the Republic of Ireland in 2009, the sale of feudal titles relating to places in Ireland seems to continue. Some years ago, Manorial Auctioneers were offering the title of the ‘Barony of Dungarvan,’ Co Waterford. 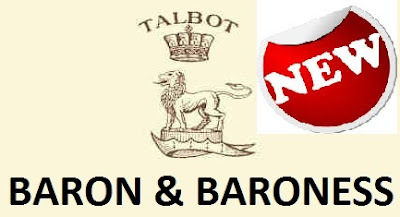 Now this supposed feudal barony is back on the market again with an online business known as nobility.co.uk. I could easily imagine the smug pleasures of being Baron of Dungarvan at Christmas time. But then I quickly realised anyone back in Cappoquin and Lismore would snigger up their sleeves at such a pretension. Who owns and who is entitled to claim the ‘Barony of Dungarvan’? Although the Barony of Dungarvan was granted to the Earl of Shrewsbury in 1446, it is doubtful that the title still survives as any kind of legal entity. Nor is there any Barony of Dungarvan in Co Waterford. In all, there are eight baronies in Co Waterford: Coshmore and Coshbride; Decies within Drum; Decies without Drum; Gaultiere; Glenahiry; Middlethird; Upperthird; and Waterford City. The parish of Dungarvan is bounded on the west by the parish of Aglish, on the south by the parishes of Ring and Ardmore, and on the east and north-east by Dungarvan Bay and part of the parish of Kilgobinet. In 1204, the Cantred of Dungarvan, one of three held by Donal O Faolain of the Decies, was escheated and the Justiciary was commanded to take it into the King’s hands. But Dungarvan was never a separate barony for administrative purposes in Co Waterford, and is a parish within the Barony of Decies Without Drum. Potential buyers are told that ‘the list price’ for this title was once £45,000, but the selling price today is £20,000. ‘A snip at the price,’ I hear you saying. But what do you get for your £20,000? So, who owns this ‘Barony of Dungarvan,’ or the manorial rights in Dungarvan, if either ever existed? In 1444, James FitzGerald, Earl of Desmond, obtained a patent for the government of Co Waterford and other counties of Munster. This patent was made by virtue of a privy seal, and by authority of Parliament. But by an act passed in the 28th year of the reign of Henry VIII, which vesting in the crown the possessions of all absentees from Ireland, all of these lands, rights, and titles were resumed by the crown. The only portion restored to the Talbot family was the title of Earl of Waterford, which was re-granted by King Charles II in 1661. The title of Baron of Dungarvan was never used by the Talbot family, nor is it referred to in the standard peerage reference books, such as Debrett’s and Burke’s. On the other hand, the title of Lord Dungarvan has been used for four centuries as a courtesy title by the heirs to Earls of Cork. Richard Boyle was already 1st Baron Boyle in the Irish peerage since 1616, when he was given the additional titles of Earl of Cork and Viscount of Dungarvan in 1620. Known as the ‘Great Earl,’ he was born in Canterbury, but he settled in Ireland in 1588, married Joan Apsley from Limerick, an Irish heiress, and he acquired large estates in Co Cork and Co Waterford, including Lismore Castle. The Boyle and Cavendish Irish estate papers, which were deposited recently in the National Library of Ireland, include copies of the letter patent to Richard Boyle, 1st Earl of Cork, for the Manor of Dungarvan, and all other lands and premises granted to him in Ireland on 8 June 1625. A second grant of the Manor of Dungarvan is dated 8 June 1629. The Boyle and the Cavendish estates included Lismore, Dungarvan, Cappoquin, Tallow, Youghal, Bandon, and other places in Co Cork, Co Waterford, Co Tipperary and in Dublin. The 1st Earl’s sons included Robert Boyle, who was born in Lismore Castle and who is the physicist who gives his name to Boyle’s Law. Richard Boyle (1612-1698), 2nd Earl of Cork and Viscount Dungarvan, also became Earl of Burlington in the Peerage of England, and his only son and heir, Charles Boyle, was summoned to the Irish House of Lords in his father’s junior title of Viscount Dungarvan in 1663. As Lord Dungarvan, he also sat in the English House of Commons as an MP for Tamworth (1670-1679) and then for Yorkshire (1679-1685). The Dungarvan title continued to be used by the Boyle heirs to the title of Earl of Cork. The present holder of the title is John Richard Boyle, 15th Earl of Cork and 15th Earl of Orrery, who was born in 1945, and his heir apparent is his son, the Hon Rory Jonathan Courtenay Boyle, who was born in 1978 and who uses the title of Viscount Dungarvan. But the Boyle family’s vast estates in Co Cork, including Lismore Castle, were inherited eventually by Lady Charlotte Elizabeth Boyle, who married William Cavendish, 4th Duke of Devonshire, in 1748. It was regarded as the outstanding dynastic alliance of the time. The Dukes of Devonshire are descended from Sir Thomas Cavendish, Lord Chancellor of England, who died in 1557. In 1547, he married Elizabeth Barlow (1527-1608), ‘Bess of Hardwick’ and later Countess of Shrewsbury, and they founded a dynasty whose members are among the largest landowners in England. On his succession in 1858, the 7th Duke of Devonshire found the family estates in a condition of ‘unexampled splendour and severe indebtedness.’ He decided that the Lismore estate, which had remained intact since coming into the hands of the Cavendish family, could no longer be maintained in the same way, and between 1859 and 1862 he sold the urban holdings at Dungarvan and Youghal, the two most expensive and contentious parts of the estate to manage. His sale of Dungarvan and Youghal ushered in a new management strategy in which ever more stringent control was placed on estate spending. Nobility.co.uk is clear in pointing out that they do not sell peerages, so what is up for sale? The Irish peerage title of Baron of Dungarvan has not been a title of the Earls of Shrewsbury since the reign of Henry VIII, the title of Lord Dungarvan is currently being used by the heir to the Earl of Cork, and the Manor of Dungarvan was sold off when the properties in the manor were sold to the tenants by the Dukes of Devonshire and the Lismore Castle Estate over 150 years ago. So, who is entitled to sell off the title of ‘Baron of Dungarvan’? And what would I get for my £20,000? Not much more than a leather-bound folder and a photocopy of a photocopy, I suspect. This was never a bargain at £45,000 and it is still not a bargain at £20,000. I would be better off buying a few bottles of craft beer from Dungarvan. At least the Dungarvan Beerage is more authentic than the Dungarvan peerage, better value for money, and likely to give me more pleasure. This is the last week of Advent, and we are just three days away from Christmas Day. Throughout this time of preparation for Christ’s coming at Christmas, I am praying each morning in Advent and using for my reflections the prayer diary of the Anglican mission agency, USPG (United Society Partners in the Gospel). Pray that children in every community might grow up with access to education and employment opportunities. Pray that their skills and creativity might find an outlet.